For software documentation, it is often desirable to incorporate screen captures of particular windows or menus, and images could include lots of interface elements. The key to accessibility is to ensure that the relevant information in the screencapture is included in the text instructions. Note that text plus images can provide an accessible alternative to a video screencast. Below is an example of what to avoid. Use the settings below to create an accessible table. ALT = "Dreamweaver Tables Properties window"
Here is the Dreamweaver information with more details in the text which provide a detailed explanation for all developers. In Dreamweaver, go to the Insert menu then Table. A pop-up window opens. 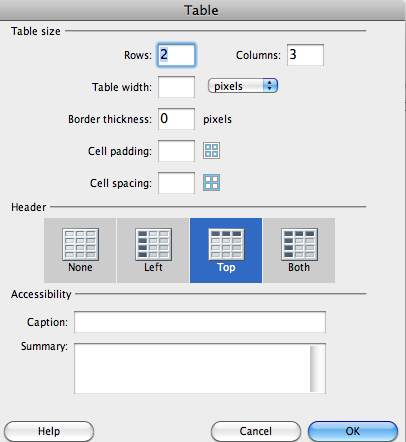 Fill in desired settings for rows, columns, width, border thickness, cell padding and cell spacing. Note: Top or Both is the most widely supported in screenreaders. Enter in text for Caption and Summary as needed. Note: Caption is visible by default to all users, while Summary is used to provide extra information for those on screenreaders. ALT = "Dreamweaver Tables Properties window. See information above"
Note that it is short because the additional information is included in the instructions above the image.